Israeli soldiers abducted, on Sunday evening, a young Palestinian man, after stopping him at the Container military roadblock, northeast of Bethlehem, in the occupied West Bank. Media sources said the soldiers abducted Badr Hussein Za’aqeeq, 25, from Beit Ummar town, north of Hebron, in the southern part of the occupied West Bank. They added that the Palestinian works in Jericho, and was on his way back home, when the soldiers abducted him at the roadblock. 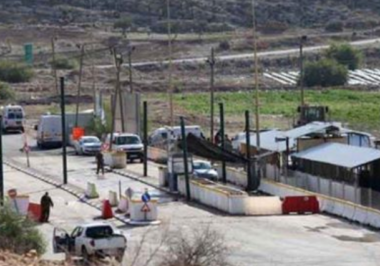 The soldiers also stopped dozens of Palestinian cars and searched many of them while examining the ID cards of the passengers and questioning them.